t*rexes and tiaras: Friday Favourites 072.. 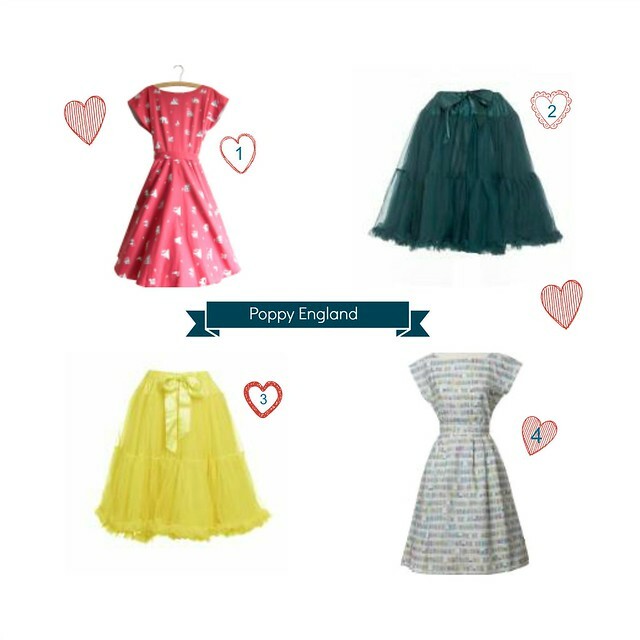 This week's wishlist is inspired by Sarah's latest outfit post - her Poppy England dress looks super cute on her, no? Poppy England started off making kids' clothes and then made the (very sensible, in my opinion) decision to make their pretty dresses for grown ups as well. Of course, as soon as I saw Sarah's post, I had to go and have a little look on the site, and these are the few things I've narrowed it down to as the things I'd like....first, anyway. 001: I think the Grace dress is my favourite style on the site, and I love this tea party print on the red background. I love the fact that their prints are based on storybook drawings, but that this dress looks totally wearable anyway; a nice grown up style. This one is on my Xmas list, for sure! 002 and 003: I love tulle petticoats. I have a couple already (not as cute as these) and when I wear one I never fail to feel like a princess. There is a huge range of colours to choose from, but I think I'd start with the yellow and this pretty emerald colour, as I'd like them to contrast with the dresses. 004: This Beatrice dress wins definite cute points for the print. Little jars of sweets. I love it! Have you heard of Poppy England before? Which is your favourite item? I'm not expecting it to take me long before I cave and place an order... I'm also rather gutted that I live so far from London as I hear they're having a sample sale tomorrow. The Grace dress is my favourite. So gorgeous. Why oh why oh why must you torture and tempt me with expensive dresses I cannot afford!!! I just looked and I saw blouses I really want!!! That tutu is absolutely stunning. I am literally going to order that on payday!! !